Teaching diabetes is hard enough. Let’s stop bringing body shame and weight stigma into the appointments. 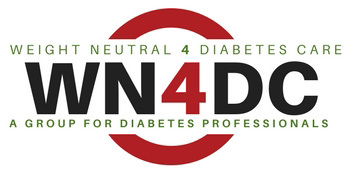 Here are four resources to help you offer a nonjudgmental weight neutral approach to diabetes education that focusses on compassionate self-care. This free professional Facebook group explores MI, HAES while providing support for professionals who offer a weight neutral approach for diabetes care. Providing your clients with a mind-changing approach to diabetes care starts with giving you practical tools to effectively treat diabetes using a non-diet, weight-neutral, mindfulness-based approach. 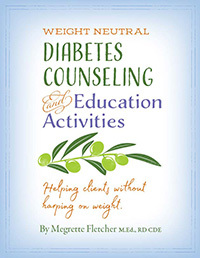 A workbook of 14 weight neutral activities that explains diabetes care without harping on weight. Am I Hungry? 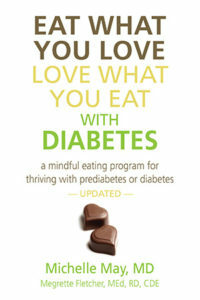 Mindful Eating for Diabetes offers a complete Diabetes Self-Management Training, an online DSMT program for clients and tools for health professionals to offer to their clients.